Summary : Mighty Leaf has done it again...another superb green tea. This Jasmine green tea is absolutely delightful to drink...with a nice, but not yet overpowering, floral aroma and and a delicious flavor. Anyone who likes jasmine teas will definitely enjoy this one. Review : I absolutely have come to love jasmine teas. The powerful and beautiful aroma of a flower garden along with the delightful floral flavor has made jasmine teas one of my favorites...especially during the winter months. And so, with the temperature hovering near 0 degrees, I was especially in the mood for a "taste of summer," so went hunting around for a tea to meet my needs. 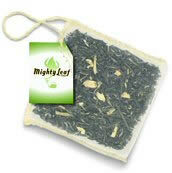 The first tea I found was a jasmine green tea from Mighty Leaf, called Mountain Spring Jasmine Green Tea. Now, while this tea is in bagged form...don't let the bag fool you. These bags are extra large and contain HUGE tea leaves, and are quite similar to pyramid tea bags. As such, the quality of the leaves that go into the tea are equal to most loose-leaf teas you are going to fine. This tea contains the following ingredients : Green tea leaves scented by jasmine flowers. Here is how Mighty Leaf describes this tea : "Mountain Spring Jasmine is made of smooth China green tea leaves naturally scented by layers of Arabian jasmine buds. With an intoxicating aroma and a piquant yet rounded cup, Mountain Spring Jasmine is our twist on a Chinese classic." The fragrance of this tea is awesome...what else is there to say? Well, how about this. The fragrance will whisk you back to memories of summer where you stand in a flower garden. And then there is the flavor. Once again, the flowery flavor of this jasmine tea is simply superb. It is very strong and quite powerful. Yet, it isn't quite as strong as some loose-leaf jasmine teas I have had before...but this isn't necessarily a bad thing. Whether you want the super-strong flavor of jasmine in your tea or the moderately strong flavor found in this tea really depends on your mood as much as anything else. And for whatever reason, tonight as I drink this tea...I found the flavor matches my needs absolutely perfectly. Like any other jasmine tea, the flavor is highly flowery. Jasmine teas come about as close as possible to actually drinking a live floral flower...in many ways it is like drinking the fragrance found in a very large and well-tended flower garden during the height of summer. The after-taste of this jasmine green tea is also superb. The delightful flowery flavor simply lingers on the tongue seemingly forever...and for me at least the after-tasted lasted nearly half an hour! I personally love this flower garden flavor flavor and aroma found in quality jasmine teas. But some won't. It all depends on taste preferences. But if you like other jasmine teas, whether it be jasmine herbal teas or other jasmine green teas...I have absolutely no doubt that you will greatly enjoy this one. Recommendation : Yes. This is a top-notch and high quality jasmine green tea. If you enjoy the flower garden flavor found in other jasmine teas, have no fear, you'll enjoy this tea greatly. As teas from Mighty Leaf can be difficult to find, your best bet to get some for yourself will be from the gourmet food section at Amazon.Com. Browse selection of Mighty Leaf Teas at Amazon. Brewing Instructions : Pour water heated to 180 degrees over tea pouch. Let brew 2-3 minutes. Lipton Mixed Berry Green Tea : A decent cherry flavored green tea. Nothing great. Nothing bad. Just average.